SCR14 MORRISH CHILDREN - Continues and provides for the Task Force on the Prevention of Sexual Abuse of Children until 2017. 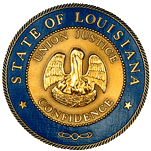 SCR29 MORRELL CRIMINAL JUSTICE - Extends the Capital Punishment Fiscal Impact Commission study and reporting deadline until January 1, 2018. SCR42 THOMPSON HEALTH SERVICES - Authorizes and directs the Louisiana Emergency Response Network (LERN) to organize and facilitate a working group of healthcare providers who deal with victims of trauma to develop recommendations for a Level III Trauma Center in Northeast Louisiana. SCR46 LONG WATER QUALITY - Expresses the right of the state of Louisiana to manage its water resources. SCR47 ERDEY TRAFFIC - Requests public agencies to require its first responders to participate in the traffic incident management process and training program. SCR48 ERDEY CONDOLENCES - Expresses condolences upon the death of Norman Alton Leggette. SCR49 THOMPSON COMMENDATIONS - Commends Pilots for Patients for its invaluable philanthropic service of providing free air transportation for Louisiana patients to medical treatment facilities throughout the United States of America. HB818 T.BURNS APPROPRIATIONS/JUDGMENT - Appropriates funds for payment of judgment against the DOTD in the matter of "Amanda Abney, et al v. Stephanie L. Smith, et al." HB5 CROMER TRANSPORTATION - Renames Grantham College Road in Slidell, La., as "Veterans Memorial Lane"
HB485 H.BURNS COLLEGES/UNIVERSITIES - Provides for the designation of a public postsecondary education institution as a "Governor's Military and Veteran Friendly Campus"